The state of Queensland lies in the north eastern part of Australia and its capital is Brisbane. Queensland has a reputation with most Australians as being a great holiday destination with excellent weather. Beautiful one day, perfect the next – that’s the slogan of the Queensland Tourist Bureau. There’s no doubt that the weather is often superb in Queensland. However it can also be quite varied, as it seems to me that storms and heavy rain are a little more common there than in Melbourne where I live. The northern part of Queensland can also experience cyclones from time to time during the cyclone season. But on balance, I would say these are not very frequent and are not major problems as far as Queenslanders are concerned. They love their state and they love Brisbane, their capital. In this podcast, I would like to tell you a little about Brisbane, one of my favourite cities in Australia to visit. Brisbane has a population of around 2.3 million, so it’s quite a large city, being the third biggest city in Australia behind Sydney and Melbourne. It is the gateway to many fantastic Queensland tourist attractions such as the Sunshine Coast which is 100km north of Brisbane and the Gold Coast which is around 80 km south of Brisbane. When our children were small, my wife and I took them to the Gold Coast to visit the fantastic theme parks which are located there. That was quite an experience and very memorable. We went to Movie World and Sea World, if I remember correctly. I can recommend them if you have any young children. Brisbane is about 900 kilometres north of Sydney. The Brisbane River flows right through the city, with the city centre being about 15 kms from the river mouth in Moreton Bay. In my opinion, the river is the major feature which makes Brisbane such a beautiful place to visit. Brisbane’s skyline, as seen from Kangaroo Point. The Brisbane River, and Brisbane itself, were named after Sir Thomas Brisbane, the Governor of New South Wales from 1821 to 1825. Brisbane was first established as a penal colony in 1824, just like Sydney had been in 1788. Free settlers first came to Brisbane in 1842 and Brisbane was made the capital of the new colony of Queensland when it was created in 1859. In more recent times, Brisbane was the venue for the G20 Leaders Summit in November 2014. People from other parts of Australia love to go on holidays in Brisbane. For example, in the year ending September 2015, there were around 1.4 million Australians who visited Brisbane on holiday, with another half a million holiday visitors coming from overseas. I was lucky enough to spend 4 days holidaying in Brisbane in late 2011. My wife attended an educational conference there as part of her work and I came along just for fun. During the day I was able to explore many of the great attractions which Brisbane has to offer. The thing I found most impressive was the Brisbane River and the interesting river walks you can do on both sides of the river. The river has wide walking paths on each side and it is possible to cross over the river fairly easily on one of the many bridges which cross the river throughout the city. In particular, I enjoyed walking on the river bank opposite the main central business district, with it’s office skyscrapers and tall apartment buildings built right up close to the water’s edge just across the river. The river is always busy with ferry traffic which you can easily catch for a ride further up or down the river. 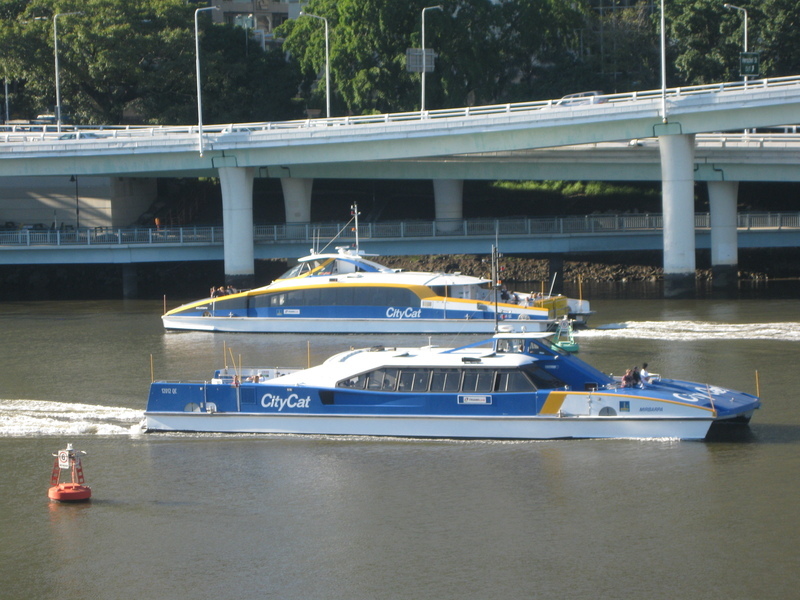 I recommend the FerryCat for a fast ride up river to check out other city attractions. My wife and I also walked along this part of the river in the cool of the evening and the lights of the skyscrapers across the water were magnificent. It was like a gigantic light show against the night sky. Also near the city centre is the iconic Story Bridge. This bridge was designed by Dr John Bradfield who also designed the Sydney Harbour Bridge. The Story Bridge is 1072 metres long and at night it is lit up with hundreds of bright lights which reflect off the water in a wonderful display of colour. It is not as big as the Sydney Harbour Bridge, but I was nonetheless very impressed with how it made the cityscape really sparkle. View of Brisbane and Story Bridge. During the day, my favourite area was the Southbank Parklands. This too is on the opposite river bank to the main city centre and consists of beautiful gardens, a man made beach, shops and restaurants, an amphitheater for concerts, a 60 metre high ferris wheel and outstanding walkways through the green parklands. I spent several hours there and really enjoyed it. A rather unexpected sight right opposite the City Botanic Gardens was the Kangaroo Point Cliffs. These stone cliffs are close to the edge of the river and are about 18 metres high. They are used regularly by climbers and abseilers. On the day that we walked along their base, we could see people of all ages trying their hand at rock climbing. It’s also a great place to have a picnic. The city also has many great museums and fine city architecture, including the Queensland Gallery of Modern Art and the Town Hall building. These are always worth a visit. My best memory of Brisbane however is from our evening walk along the river. The lights were amazing and the weather was cool and refreshing. We crossed over one of the bridges and walked along the river bank marveling at the city buildings and lights on the other side. We came across the Brisbane Jazz Club and decided to go in. What a treat! Andrea Lisa and her excellent band were playing. That was a great way to finish our visit to Brisbane, the river capital of sunny Queensland. Podcast 73 Quiz - Did you understand the podcast? True or False? – Rob thinks the weather in Queensland is very good, but not all the time. True or False? – From Brisbane, tourists can go to other attractions north and south of Brisbane. True or False? – Rob thinks that the theme parks are the best thing about Brisbane. True or False? – There are more overseas tourists who go to Brisbane than Australian tourists. True or False? – The thing Rob enjoyed most in Brisbane was taking the ferry up river. True or False? – The skyscrapers in Brisbane look wonderful from the other side of the Brisbane River. True or False? – Rob spent several hours taking a ride in the Ferris Wheel in Southbank Parklands. True or False? – Rob thinks rock climbing is dangerous at Kangaroo Point Cliffs in Brisbane. True or False? – Rob thinks that the Story Bridge in Brisbane is not as good as the Sydney Harbour Bridge. True or False? – Rob thinks that the Brisbane River is the most impressive feature of Brisbane. educational conference = a meeting of people to discuss things about education. Great post Rob in which you highlight the many attractions of Brisbane and the Sunshine State of Queensland. The Qld Tourist Bureau is going to love you! Many thanks for your comment. You are right about the Sunshine State. Beautiful one day, perfect the next. Still love Melbourne however, even if the weather is not always as good as in Brissie.